Soft and snuggly is what bedtime (and even just cuddle up time) is all about. There are some new cute critters that we thought you would enjoy for your den, check these out- they are perfect for Easter or Passover. “CONGRATS! Our lead designer has just reviewed and approved your picture for Petsification. This designer also transferred your photo into our special Petsies plush coding machine, so that we can create the best plush representation of your pet. Next steps: Two more designers will work on picking fabrics and crafting the shape of each individual piece of plush that goes into your design. We looked forward to our updates, and when we got the email with shipping notification, the wait was on. 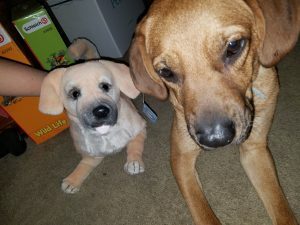 My son stalked the delivery man, and was completely thrilled with the outcome of the plus twin of his pup, Teddy. Get yours at https://www.mypetsies.com Right now there is even a sale going on, so the time is good. 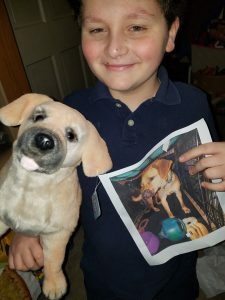 His favorite part was one of the last emails, which send a photo, front and back, of what the toy would really look like- the actual toy they were sending. 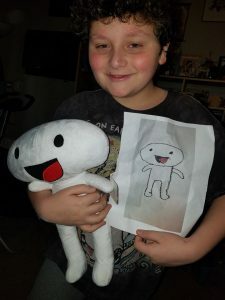 Seeing his creation as a real plush was very exciting, and he was even more thrilled when it got to the door. These are super fun, very unique and a great way to spend some fun family time before the toy even gets to you. You can take a look at https://www.budsies.com . 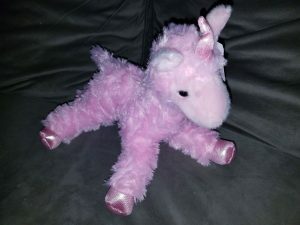 A fun, no fuss toy thats easy to pick up and would be great to put in any Easter Basket or as a Passover gift is this adorable Little Daydream the Stuffed Pink Llamacorn Mini Flopsie by Aurora . Super adorable, comes in quite a few sizes (smallest is only $4.99) and very trendy right now, this little llama has it all. Super soft, shiny, glittery horn and hooves, a unicorn horn, and did we mention it’s a llama? Everyone’s favorite ungulates are extremely popular right now, and this little guy embraces a lot of the toy trends of 2019, making it a great choice for pretty much any kid who loves stuffed animals.